Do you want to put your technical skills to a business idea? Do you wish to learn the nuances of managing a business? Are you keen on floating your own start-up? If yes, management should be your choice of study. Have a look at these popular courses in Management that are designed specifically for engineers like you. Also, the best part about pursuing your management course is that most schools from across the globe accept your GRE scores! Moreover, you can never run out of options in the field of management. There are several management courses like MEM, MIS, and MBA that offer a challenging and lucrative career. So, go ahead and explore this exciting field and zero in on the right course that you can pick. Are you aware of these courses? There are numerous career paths and choices of study for engineers. Be it in the areas of Engineering & Technology or Engineering Management, there are several niche courses that you can pursue. These courses are specifically designed to impart both engineerings as well as business perspectives. Moreover, as a management student, you will have the opportunity to learn the practical aspects of engineering along with core business subjects. Masters in Engineering Management (MEM): This multidisciplinary field of study offers numerous opportunities in the fields of business methods and engineering processes. 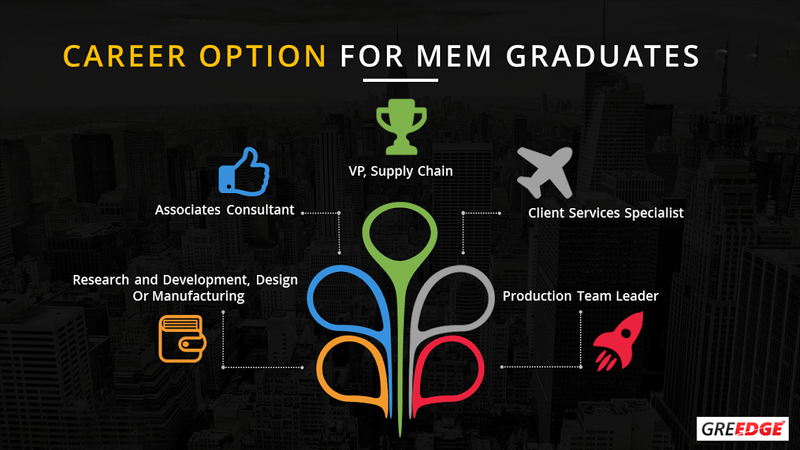 As a MEM graduate, you will have a diverse range of coursework including new product development, lean improvement, experience design, technology strategy among others. Is MEM ideal for me? If you are someone who can just put things together and integrate technical and business skills, then MEM is the right program for you. Even if you are someone who wants to learn the tricks of managing a startup and explore technical entrepreneurship, MEM is your right field of study. Or simply said, if you are a skilled engineer who wants to understand the essential principles of a business, then MEM is your appropriate choice of study. What will my career path be like after MEM? Engineering Project Management : Are you someone who can strategize projects and achieve your specified goals? Do you feel that you have a flair for setting targets and allocating resources for a project? Industrial Management Engineering: Industrial management engineering is one niche field of operation that integrates engineering concepts to the management of people and material sciences. Rightfully said, Industrial management engineering offers you the scope to apply your scientific knowledge to everyday practical problems. Supervising the lifecycle of a construction project. What will my role be after MEM? Master’s in Engineering Management is often seen as a course that has a wide range of learning methods. Courses for Master’s in Engineering Management are taught through workshops, case studies, and engineering design activities. As a part of your curriculum, you will use tools like 3D modeling to find solutions to various business problems. Moreover, as a MEM graduate, you will be someone who will comprehend the engineering and business aspects of technology. What are the best universities for me to do my MEM? Master’s in Engineering Management is an appropriate course of choice for you if you want to apply engineering technologies to business practices. As a MEM graduate, you can be assured of a challenging and lucrative career as a client services specialist, associate consultant, production team leader, and head of a supply chain. 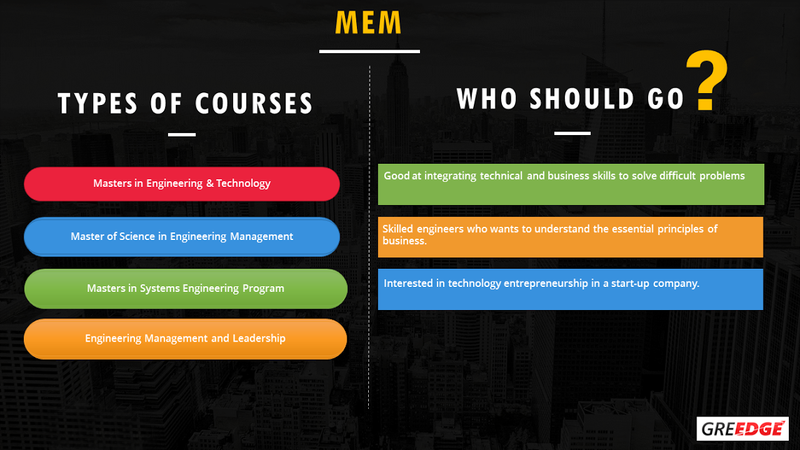 You will certainly not run out of options if you pursue MEM and you will indeed be bagging opportunities from both domains—engineering and business. Do you want to know more about MEM? Do you have any queries regarding the GRE scores for MEM? Shoot your questions and our experts will revert back with the answers. Can you please categorize universities as safe, moderate, ambitious for engineering management in USA for fall 2017 . I haven’t given my GRE yet, will write by October. Awaiting for your reply as it is very important to know about the colleges that I can apply. Well, given the fact that you don’t have your GRE score with you, we are unable to classify the universities as safe, moderate and achievable. Moreover, to classify any university as safe, moderate or achievable, we will have to consider all factors like your GPA, GRE scores( if available), IELTS/TOEFL, relevant work experience among the several others. So, update us on your GPA, Topper’s GPA, Work Experience (in years) and expected GRE scores. 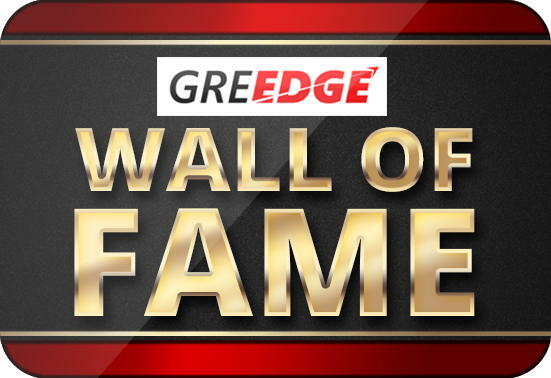 Do write back to info@greedge.com with your details for us to help you out. And, All the best for your GRE! Is work experience mandatory for pursuing mba .I had completed my graduation of mechanical engineering in 2014 but I have not any work experience. Will you please post the same for MIS aswell? I have 318 in GRE. (154va 164qa). TOEFL 105. GPA 8.55 work ex of 25 months in manufacturing industry. Published one international research paper in college. Can you suggest safe moderate and ambitious universities for the profile ? Wonderful article! I have been looking for some information on career in engineering management & it’s scope. I got to know that it has a good scope as it demands it demands a combination of engineering and managerial knowledge. Here after reading your article i am glad to know all vital information about engineering management career. Thanks a lot for sharing! Next story What should Fall ’19 aspirants learn from Fall ’18?